Did you know that as much as 96% of the water from the middle section of the Deschutes River in Bend can be diverted into irrigation canals during the summer months? This creates a dramatic reduction in streamflow in the Middle Deschutes leading to habitat degradation, water quality problems, and an unhealthy river system. Avion Water Company, owned and operated by Jan Wick and his family, has partnered with the Deschutes River Conservancy (DRC) to create the Blue Water Program (PDF). Blue Water is designed to provide an opportunity for Avion Water customers to support the restoration of the Deschutes River through their monthly water bill. 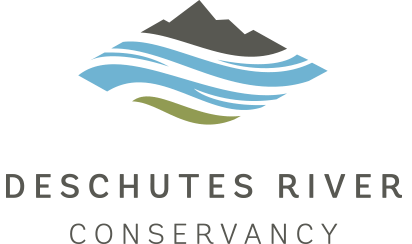 Blue Water offers four different donation levels starting at $1.60 per month and going up to $6.40 per month (at $1.60 increments), 100% of which goes to the DRC’s streamflow enhancement programs, such as leases and instream transfers, on the Deschutes River above Lake Billy Chinook. In 2017, Blue Water created $12,625 in donations which helped to lease 926 million gallons of water back instream. Blue Water funds are used only to pay landowners to lease water and to pay the required state fees to lease water. DRC matches these funds with other funders who pay for the related staff time to generate these instream leases. and up to a total of 97.2 cubic feet per second instream or about 8 cfs per year. The DRC would like to thank Avion Water Company and their customers for helping us achieve our mission.